Watch this space for a new paper on the formation of hyperextended margins which should be out in the next week or two. Below a photo from the Gulf of Suez (Hamman Faraun fault block north of Abu Zenima) taken during a field trip a few years back, which illustrates how a continental rift looks like just before continents break apart. 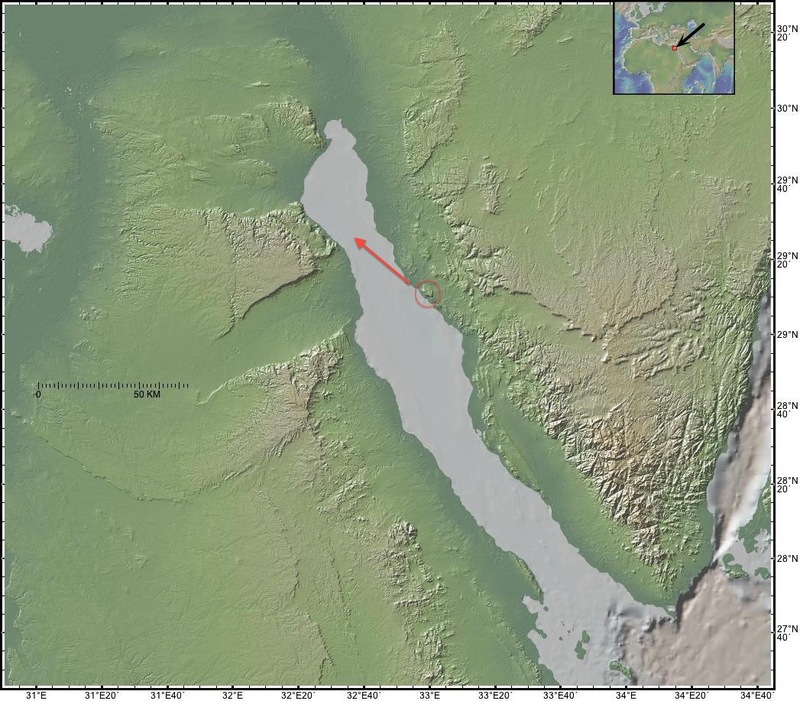 Overview map with hillshade relief of the Gulf of Suez region (GeoMapApp) with location (red circle) and view direction (red arrow) of the photo below. 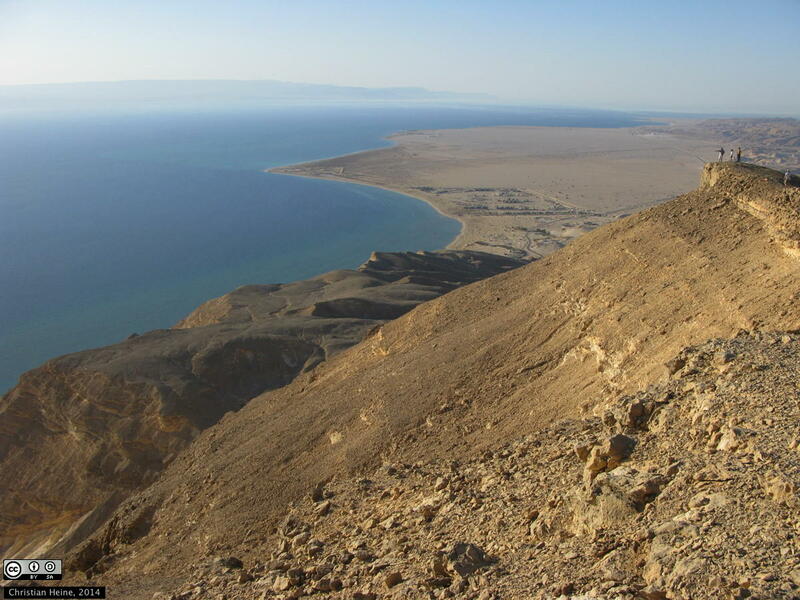 A view of the northern Gulf of Suez looking northwest from the Sinai towards the African margin. 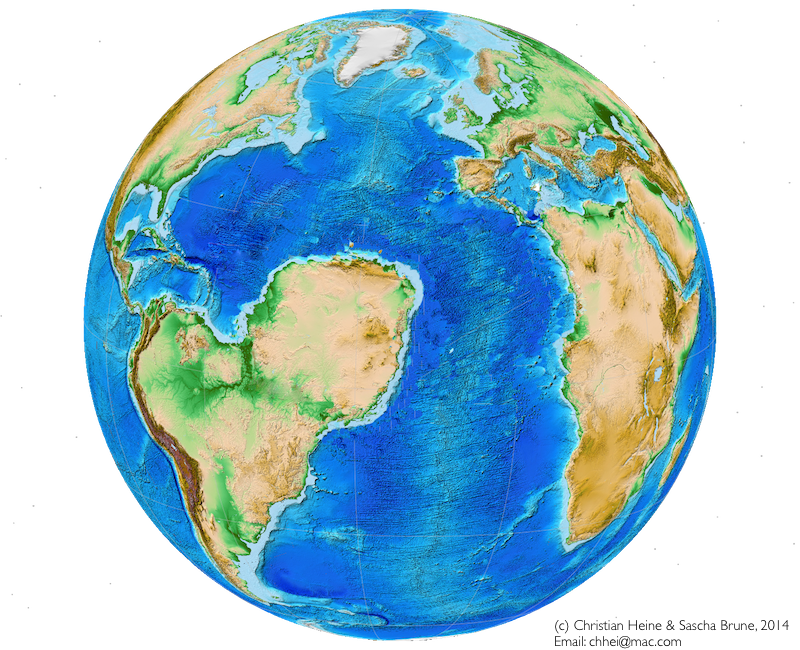 This is how the very young South Atlantic could have looked like in the Cretaceous. The photo is taken from the Hamman Faraun fault block north of Abu Zenima (Openstreetmap link) . Picture licensed under a Creative Commons Attribution-Share Alike 3.0 license. This entry was posted in Plate tectonics, Publishing and tagged Gulf of Suez, Rift on 17/05/2014 by Christian. Our “Saharan Atlantic ocean” paper has just been featured in GEOLOGY’s “Research Focus” article in the March issue. The focus article is entitled “Roadmap to continental rupture: Is obliquity the route to success?” is written by Cythia Ebinger and Jolante van Wijk and is available as open access. This is fantastic news! Update #1,2,3,4,5: So by now, there’s been quite some science (and popular) media buzz with both Sydney Uni and GFZ Potsdam having released press info on our article – it’s been overwhelming. Spiegel Online (one of the largest German online news outlets) & Sueddeutsche Zeitung (also one of the largest papers) reported in Germany even going a bit beyond the standard press release texts. As Sascha and I hoped, our hypothetical “Saharan Ocean” image (see here) facilitated the take up of the story quite a bit. According to Altmetric, the article is currently ranking as #7 in terms of impact which makes it one of the highest ever scores for articles published in GEOLOGY. science20.com: Gondwana: What sculpted Africa’s margins 130 Million years ago? CBC Canada’s Quirks and Quarks: I was interviewed by Bob McDonald on “How continents stay in shape” (link to website with podcast). Our map and an article on are featured on BigThink’s Strange Maps blog post. [2014-05-12] We’re featuring in this month’s GFZ Potsdam’s GeoForschungsZeitung: “Kontinentales Tauziehen” [PDF link, in German] and link to the GFZeitung [GFZ Potsdam, in German]. This entry was posted in Plate tectonics, Publishing and tagged Africa, GPlates, Plate reconstructions, South Atlantic on 04/03/2014 by Christian.